SEARCH ENGINES AND SOCIAL MEDIA IS A GOD SEND AND IT’S FREE TO THE PUBLIC, I HOPE THE REGULATION LONG KNIVES DON’T DEEP SIX THEM. NOTE: Extreme liberalism insanity, immigration dependency insanity, moral decay, culture rot, less and less money buying power, etc. All are the result from a lack of societal discipline, which the USA had before the arch-evil 1938 socialist minimum wage law came about. Duh. 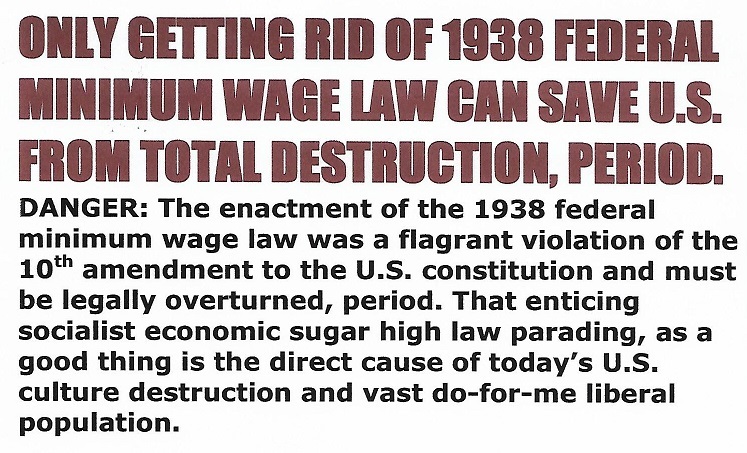 The survival thing to do is let the federal government repeal this arch-evil 1938 socialist law, then let the states, local government, and private enterprise set their own minimum wage laws, that will solve the USA survival threat once and for all. FREDDIE LEE SIRMANS LOG: 02 APRIL 2018, 2327 HOURS. This writer see all of this liberal hog wash concerning search engines and social media as making a mountain out of a mole hill. Like climate change this writer see the whole thing as just another liberal flight farther away from common sense and sound judgment. The mountain out of a molehill problem is because liberals tend to see human beings as just cogs in some giant big government machine, which they fail to realize that we are actually flesh and blood and responds only to reward or punishment. Sure, I have searched online for items and for the next month or so they pops up here and there, and naturally it is a little annoying, but that would never make me buy anything against my will, period. And that is why I think this whole liberal uproar about the effectiveness of this logarithm stuff is way oversold. The liberals never had a problem with search engines and social media back when they had a monopoly, but now since the conservatives have come onboard they want to drown the logarithm process with regulations. The older I get the more I’m convinced that as a rule for the most part people are going to believe and do what they want to even when it doesn’t make any sense. The real truth is the liberals don’t fear search engines and social media logarithms, what they really fear is a conservative free speech level playing field like unrestricted to all comers talk radio, period. There is no real problems or threats with search engines and social media, simply because everything is all out in the open, where everyone can see, there is nothing else left to hide. The real problem is the invasive hidden stuff. To be frank, I know hardly anything about the workings of logarithms, I'm just expressing my common sense and sound judgment opinion, that's all, you be the judge. FREDDIE LEE SIRMANS LOG: 31 MARCH 2018, 1654 HOURS.